Copenhagen has motorways, just like anywhere else. 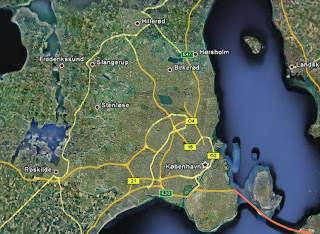 Being the capital city and the main metropolis in the region, all roads and railways lead to Copenhagen. The geographical layout of the city located on the sea resembles an outstretched palm with five fingers of infrastructure all funnelling towards the spot on the wrist where the pulse is found. There are two main motorways leading to the city from afar. The E20 brings traffic from the rest of the nation and the rest of Europe to the south. It continues on over the bridge to Sweden and on to Stockholm. The E47 sweeps down from the north, where ferries arrive from Sweden. Then there is a network of motorways that slice through the urban sprawl, bringing commuters into Copenhagen from different directions. I rode out along the #16 Motorway the other day and the film, above, is the result. The #16 isn't that long. It starts about 30 km out, deep in surburbia near the town of Hillerød. From it's source it is already a funnel for a catchment area farther north. 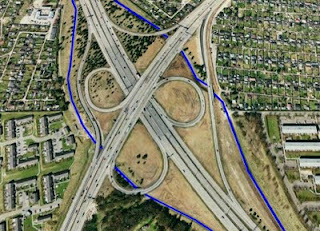 In addition, it picks up traffic from the urban sprawl along its length. When it approaches the city limits, three southbound lanes narrow to two and traffic is reduced to a crawl. Ironically, most of the motorists have driven past a series of S-train stations with frequent departures, all leading to stations in Copenhagen. But enough about that. What may be interesting is that along much of the length of the #16 there are separated bicycle lanes running parallel on both sides. Bicycle superhighways, as it were. Similar parallel bicycle routes run along many of the other motorways. 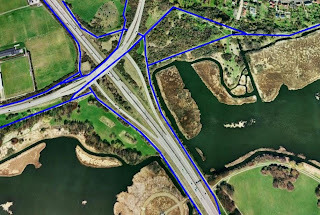 One example can be seen in this post about me cycling to IKEA along the #19. These parallel routes have been in place for a long while and are not to be confused with the new 13 super routes I wrote about not long ago. Those 13 routes are mostly being developed along regular city streets along the various fingers of the outstretched palm to boost bicycle traffic. These parallel bicycle superhighways give people on bikes the opportunity to ride if they so desire. Along the #16 there are between 2000-4000 cyclists each day in both directions. Most traffic follows the motorized rush hour, but there a number of large companies farther out and people can ride away from the city in the morning. Providing super routes along the motorways is logical. You don't get people to ride bicycles if you wag your finger about 'saving the planet' or blabbing on about 'getting healthy'. You get people to ride by providing safe and very direct routes to where they want to go. Not where YOU want them to go... where THEY want to go. In the 1980's the City of Copenhagen tried to create bicycle routes through the city away from the busy streets. Thinking, logically and intuitively, that people would take short detours and add a few minutes to their commute in order to get away from traffic. They were wrong. People continued to cycle along the most direct routes. People on bikes are no different than people in cars or on trains. They want to get where they're going as quick as possible. The result was that the City shrugged and starting the development of separated infrastructure along busy streets. It continues to expand to this day. The majority of cycling Copenhageners, when asked what their main reason for cycling is, say that it is because it is quick and easy. There's the rub. Back to the #16. I used to ride out of town each day when I worked at Danish Broadcasting's former headquarters. Rain or shine, snow or wind - or both. Many cyclists on this route come from farther afield so it's here that you'll see some lycra and gear but there are also many, many cyclists that just pedal along in their normal clothes. Men and women alike - an almost even split even out there. Here's a satellite shot of a major motorway junction a few kilometres farther north from where I shot the film. You can see the bike lanes in blue. There are underpasses for the lanes in order to keep things quick and easy. In this photo you can see that the lanes are in the north-south direction, but there are no clear lanes on the motorway running east-west. Simply because the traffic is heading to and from Copenhagen and not along the ring motorway around the city. Sure, there are bicycle friendly streets in the neighbourhoods if you HAVE to ride that way but you don't build infrastructure where there is no potential traffic. In this photo, closer to the spot where the motorway ends and enters the city, the network of bicycle lanes is more pronounced. The parallel lanes still run through underpasses but there are lanes branching out in all directions. The very best thing is that you get to roll happily past cars stuck in traffic, as you can see in the film. This direct and very visual aspect is a bonus to riding on the route. It can only serve to encourage those on bicycles to keep on doing it and, hopefully, encourage motorists to consider choosing the bicycle.